Though you finished your mulching, fertilizing, and general yard clean up during the springtime, your yard will probably need touch ups throughout the summer. Check for areas where mulch may have shifted. Re-mulch where needed throughout the season to continue keeping weeds at bay. Watch plant growth as well, and if plants are showing signs of slow growth even when there are no indicators of disease, bugs, or other external problem, it could be a sign of insufficient fertilizer. Another summertime maintenance task is plant scouting, taking a careful and close look at your plants’ stems and leaves for any signs of fungus, bugs, or lack of sunlight. Doing this several times throughout the season will help you keep plants, shrubs, and trees healthy and beautiful while avoiding the use of damaging chemicals. When plant scouting, look over the plant’s entire stem and check on top of and under leaves for signs of discoloration or tiny black spots. On plants with needles, fungus can present as white growth. Bugs harmful to plants such as mites and insect larvae need to be removed, as they can cause severe leaf damage. Making sure that your plants are receiving the proper amount of sunlight is also crucial. As the Earth tilts, areas that were sunny in the spring may grow shady as sunlight to your yard is blocked by your house or fence. When determining how much water to give your plants to drink this summer, it is key to strike a good balance between the rainy weeks and more drought-like conditions. Under-watering often results in droopy plants with slow growth and it may encourage shallow roots. Over-watering can cause root rot and create a soggy environment that favors fungus and mildew growth. According to the Massachusetts Water Resources Authority, established lawns and gardens need to be watered only once a week to a depth of an inch. During weeks when it rains, watering can be skipped. An exception is when transplanting new plants from a pot or laying down sod. Get new plants established by watering deeply three times a week, but after the plants have settled after being moved, change to a normal watering schedule. 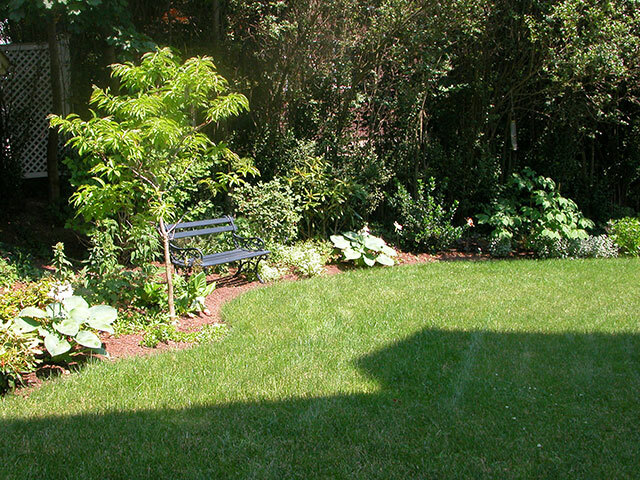 Another good routine to get into during the summer is weeding. Anywhere there is an opening in the ground is an opportunity for your yard area to grow weeds. 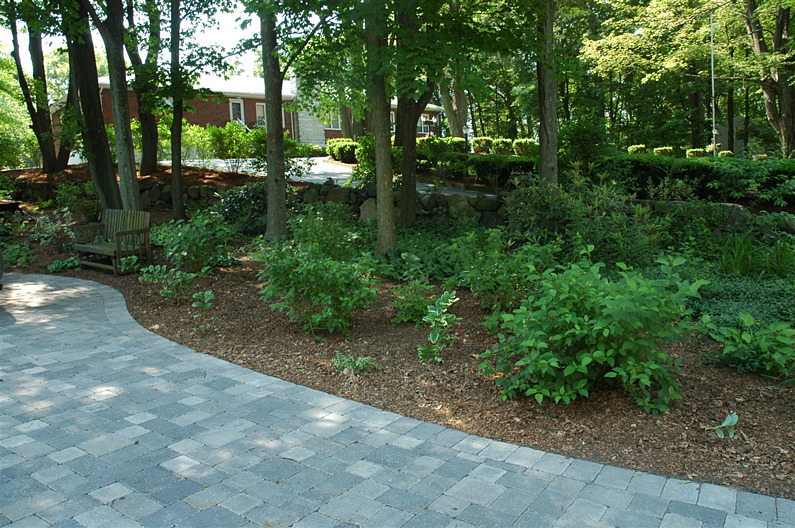 Cover these open areas by replacing mulch that has shifted or dissipated and planting short perennials and creeping groundcovers. Eventually, these plants will take over the lower level of your garden and prevent weeds from coming through. Some weeds will make it through the barricades you’ve built, so dedicate time every week to weeding your yard. A consistent routine of twice a week for an hour each session is a great way to keep your yard clear of weeds and avoid using weed killing chemicals. 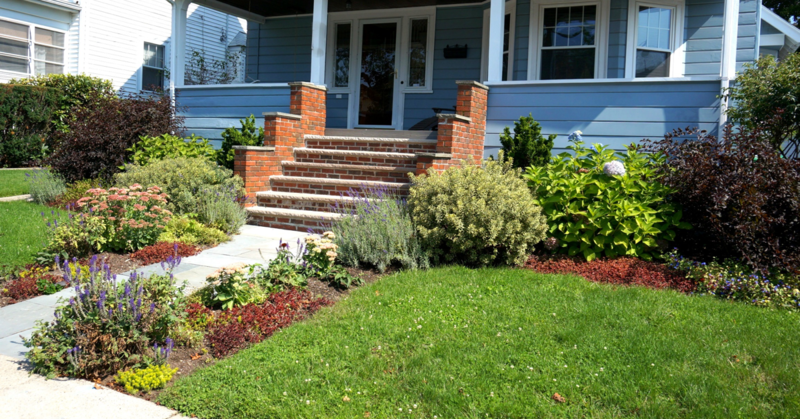 Keeping your yard beautiful all summer is possible with consistent maintenance and care. Good watering habits, weeding, and plant scouting are all healthy, organic ways you can preserve the hard work you completed during the spring. If you need help determining how to best care for your yard this summer, contact the experts at Moodscapes for assistance today.